Bayern Munich began the hunt for a record-extending 19th DFB Cup title against fourth-tier side Drochtersen/Assel in a true battle of David vs. Goliath in the first round, settled by only one goal. In his first cup match since winning the competition against Bayern with Eintracht Frankfurt last season, Niko Kovac named a full-strength side on Saturday afternoon. His troops, who came into this game off the back of a convincing Supercup win over Frankfurt, were dominant without creating many chances. The best chance of the first half fell to the home side, in fact, as Florian Nagel was found in front of goal with only Manuel Neuer to beat. But the German international saved superbly with his feet to deny what would have been a dream goal for the fully-amateur team. The second half produced much of the same for Bayern and it was a matter of when, not if they would score. However, the Bundesliga champions left it late to eventually take the lead. Thomas Müller had a goal ruled out for offside with ten minutes left, but only a minute later Robert Lewandowski had Kovac’s side ahead. Great work from Franck Ribery down the left allowed the Frenchman to cut the ball back to Leon Goretzka. The former Schalke midfielder’s shot was poked beyond the goalkeeper in his typical poacher style by Lewandowski to earn Bayern their place in the next round of the competition. 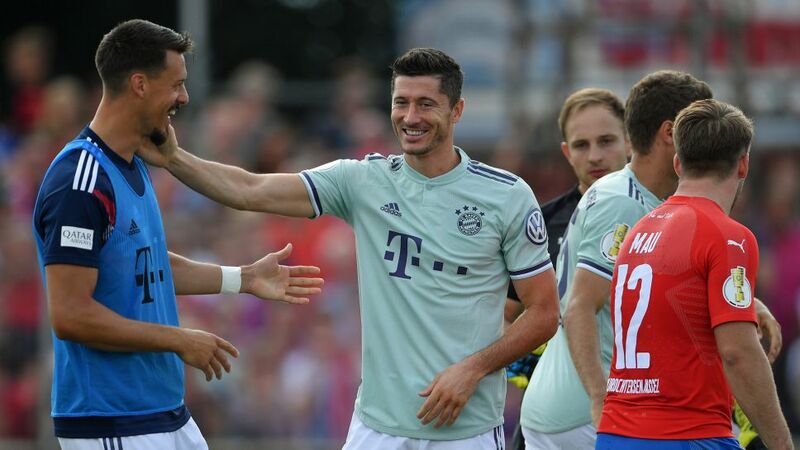 This was the first competitive meeting between these two clubs.Claudio Pizarro (30) is the only active player with more DFB Cup goals than Thomas Müller (27) and is now joined by Lewandowski.Lewandowski has scored seven goals in his last four first-round appearances.Only Oliver Kahn (31) has kept more clean sheets in the DFB Cup than Manuel Neuer (27).Kovac has only lost one of his 13 DFB Cup matches as a coach, reaching the final in both campaigns with Frankfurt. He won the league and cup double as a player with Bayern in 2002/03.Bayern have twice fallen in the first round (1990/91 and 1994/95) and have not lost to lower league opposition since Alemannia Aachen in 2003/04.